The release of the Canadian small-capacity Twin Otter is set for 2014, in the city of Ulyanovsk. The project will be supported by Yamal-Nenets Autonomous District, which is in need of such machines. The first working draft for the production of small aircraft in Russia — particularly, for DHC-6 Twin Otter airplanes — will appear in late 2014, Vyacheslav Ilyushin, a representative of the Aviasoyuz association of regional and small aviation, told Vedomosti. The Canadian regional aircraft, developed in 1964 and renovated in 2010, will be released by the first resident of a special economic zone in Ulyanovsk — the company Hero, which founded Aviasoyuz. The project will be presented at a joint meeting between the association and the government of Yamal-Nenets Autonomous District in mid-August. Authorities of several regions have shown interest in the Canadian aircraft and in its possible operation in the Far North and the Arctic, Ilyushin explained. "Not waiting for the start of production, we decided to buy nine aircraft in Canada for the program — for example, the airline Chukotka Air,” the Aviasoyuz representative said. The general director of Vityaz, Sergey Antsiferov, reported that the company plans to produce 24 such machines a year. In order for the project to pay off, around 50 aircraft have to be produced, Ilyushin noted. According to Antsiferov, the investment program for the Twin Otter assembly project amounts to about $ 80 million, and $50 million has already been spent. According to his calculations, the federal program to support civil aviation in 2015, which is led by the Ministry of Industry and Trade and has earmarked 1.3 billion rubles ($39.3 million) for small aviation, compensates Canadian aircraft leasing rates. In addition to the DHC-6 Twin Otter in Ulyanovsk, the plan is to collect other Canadian aircraft — in particular, the Q-400 Bombardier. The capacity of this model is up to 78 seats, and its flight range is up to 1,550 miles. The list price of an advanced version of the aircraft is about $ 30 million. According to the chief editor of Avia.ru, Roman Gusarov, the Russian aviation industry is following the same path that the Russian car industry did: It does not create unique products, but adopts Western technology. Thus, even in the case of the Russian SuperJet and MS-21 airplanes, half of the parts are Western. The expert noted, however, that this is a global trend. If, in the case of the SuperJet and MS-21, the matter is about integrating the best of Western technologies, then, in the case of small aircraft, Russia has taken the path of conventional screwdriver assembly. 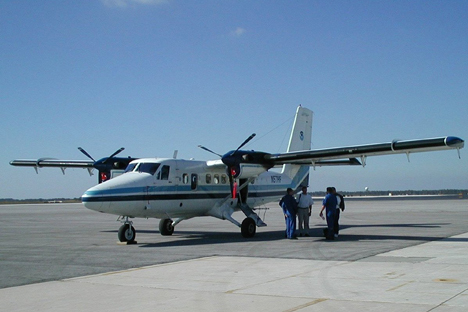 Nonetheless, Gusarov believes that it is difficult to come up with a better product than the Twin Otter.